It’s already starting to snow on the Canadian Prairies, serving as a reminder that winter is coming…And fast. Redwood Plastics offers a number of plastic solutions that assist industries facing the often bitter northern winters. Outrigger pads made out of wood or metal are still common, which creates potential problems as these are not the optimal material. Already subject to corrosion, rust, and rot in any climate, the cold northern winters can make wood especially very brittle. This creates an unsafe situation where the pad may fail resulting in an unstable piece of expensive equipment that could put operators at risk. Redco™ Outriggers are made out of UHMW or Nylon, superior materials for this task. They can handle temperatures down to -80 celsius, while withstanding up to 1,000,000 pounds compressive force. Despite these remarkable properties, they still weigh only 1/7th as much as steel. For more information on our outrigger pads, click HERE. Truck beds are subject to severe abrasion in many tasks. 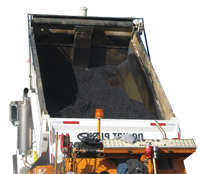 Asphalt, rocks, and other aggregate loads can damage truck beds and frustrate drivers with material hang-ups costing time and resulting in expensive bed maintenance or even replacement. In winter, the addition of snow and ice can exacerbate the problem. Ice itself is abrasive; however, it also creates clumps with other materials which can cause further damage. Ice and snow cling easily to metal and could cause severe material hang-ups as well. Redco™ Tivar® is also available in several custom formulations including ceramic filled and static dissipative. Don’t let winter wreak havoc with your equipment. For more information on Redco™ winter solutions please contact us.